To engage volunteers from the community to assist local officials with this tree planting endeavor, publicity notices were posted on Lima’s website and social media pages (HFL Community Facebook page and TubbsHubb Nextdoor App), to community bulletin boards, and to local newspapers, including the Livingston County News, The Honeoye Falls-Lima Sentinel, and the Genesee Valley Penny Saver. 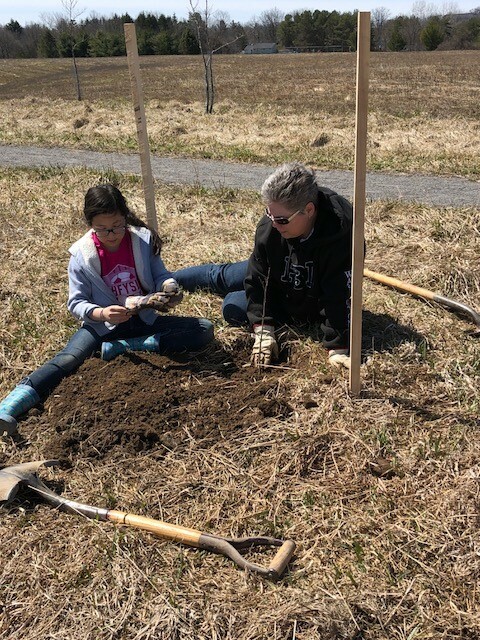 Prior to this Arbor Day event, one volunteer planting event was been held in the Park, and 15 native trees ranging from 3 to 5 feet tall were planted at that time. In order to build upon that start and to identify the most appropriate tree varieties and best methods for planting seedlings, the town and village sought guidance from NYSDEC Forester Brice June, who conducted a site visit with two Lima officials on February 21, 2018. After learning about site objectives, Brice recommended planting a variety of seedling trees, including oaks, maples, hickories, sycamores, white spruce, pawpaws, and lilacs. Prepping soil for the new Mark Tubbs Park seedlings. With the help of 20 community volunteers and the Boy Scouts, Lima was able to plant approximately 200 trees of various species. 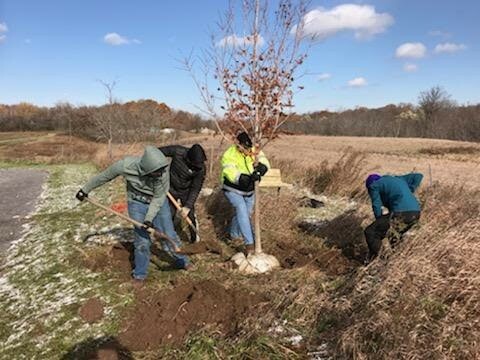 With the Arbor Day grant funding, the Village was able to secure the 90 hardwood seedlings with 5-foot-high fencing to protect them from wildlife. Even with the very hot, dry summer of 2018, volunteers were able to water the seedlings on a regular basis, and 85 survived into the fall. During the early summer the Village was approached by Lima Eagle Scout candidate Zac Ha asking to install three benches as part of his community service project at the park. 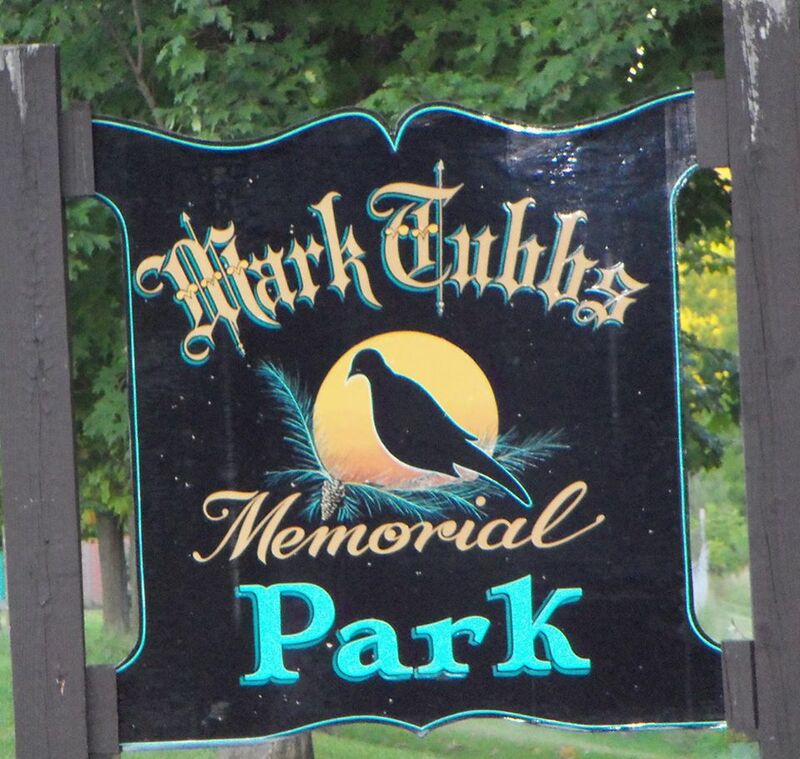 At the same time Kyle Bieter, also a prospective Eagle Scout, proposed building and installing bird houses to attract more species of birds to the park. The Village board eagerly approved the projects and decided that since the Village was able to secure donations of supplies toward its planting effort and volunteers to water, it could afford to purchase large trees to be planted by the Scouts. They will provide shade for the benches and additional habitat for the birds while residents rest and observe the bird houses erected nearby. In conjunction with the Town of Lima, the Village of Lima has formed its Tree Committee, which will advise on the selection and placement of trees to enhance the community’s tree inventory and enjoyment of public spaces. Additionally, the Committee will organize an annual volunteer work day to plant and assist with maintenance of trees in park areas. Meetings will be held at least twice annually, in the fall for assessment and planning, and in the spring to organize the annual public tree planting event. Committee members will number five and will include one elected representative from the Town and one from the Village, one member of the Planning Board, and two at-large members from the public. A chairperson and secretary will be chosen from among the members.